I have just realized that doing art by hand needs some courage. Unlike digital work, you cannot undo those lines you draw in ink and colors you paint will be evidence of your either clever or stupid decision. It's quite scary and I respect those who do analogue art because I don't think best work comes at a first try. It needs a lot of practices and determination. 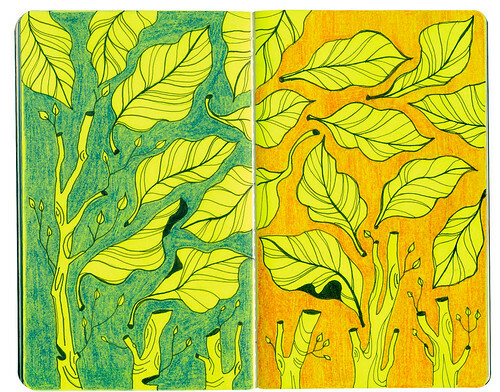 For this spread, I had already known in my mind what black lines would look like on fluorescent green. The result satisfied me. But then a question popped up : how about color background? That's when I hesitated. I knew I wouldn't do this design all over again if I ruined it so color choice should be appropriate enough. In all, I enjoyed doing this pages and forgot all frustration I had had earlier with my computer problem. 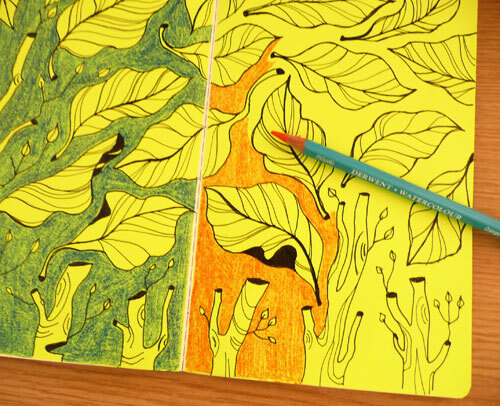 It's quite an art therapy.